@The Inquisitor, made by Microsoft! @The Inquisitor, It might be severe enough to turn you into Deadpool. @NikolaFreakingTesla, the real question is: is super cancer better or worse than normal cancer? @The Inquisitor, I got super excited by your name. @Mad Br0, it was painful to read. @Mad Br0, Are you mad bro ? @Mad Br0, that's probably the joke but i'm not too sure. @Mad Br0, this is kinda funny. Not the comment but the fact that somebody decided that dog noses kinda looks like thumb pads. Like wtf were they doing when they made that discovery? @Titaintium, probably playin ps and thier dog was nosing up under their controller. The inaccuracy in this has given me cancer. I will now spend my last days alive playing GameCube with my Playstation controller. @Showzs, My favorite was Microsoft's Wiistation. Ow. Just ow. 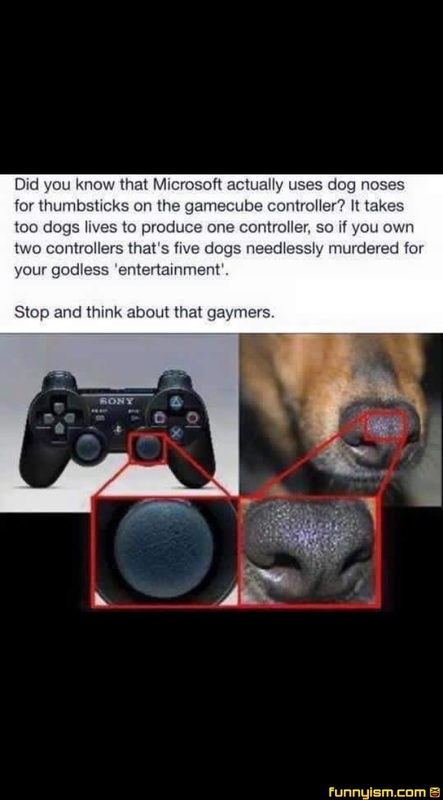 and just because I can't help myself: *Nintendo made the GameCube, not Microsoft *That is a Playstation controller *Two, not too *2x2 is 4, not 5 *Videogames aren't godless. Ever heard of God of War? *This entire post was so ridiculous, it gave me cancer. Then it gave my cancer AIDS and my cancer died off, leaving me healthy again. Run to the next pic before you catch the stupid! Microsoft and their dumb PS3 controllers. 'Too' dogs X 2 is 5...someone call the Fringe Division!! Something tells me a Trump supporter made this. DAMIT DOGS!! TAKE ONE FOR THE TEAM!!! I NEED TO USE QUIET TO NOT SHOOT THE CHILD SOLDIERS !!! *Com rings in* "SNAKE!?! YOU KILLED A CHILD!!! IM ENDING THE MISSION" HOW WAS I SUPPOSED TO KNOW SHE'D SHOOT EVERYONE WHEN THE ALARM WENT OFF!? Too angry to care what the joke is. Are we going to ignore that according to this guy's logic: 5=4? Too plus too equals five. This post just gave me cancer. "So you're telling me this right here is Fido and Cheech?" @I shjt you not, "gay mens"